BBM's website today listed three new products coming out - the new Hawks set, the new Buffaloes set and the 2008 1st Version set. The Hawks and Buffaloes sets should be out in March and the 1st Version set will be out in April. Update: I forgot to mention that there's some sort of Lions historic set out soon also. Looks like another box set with memorabilia cards that pushs the price up quite a bit. 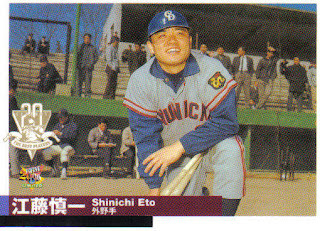 Shinichi Eto has passed away at 70. Update: Gary Garland has a detailed biography/obituary here. Got a package in the mail from YakyuShop the other day containing the some of BBM's latest offerings - the Atsuya Furuta Retirement box set and six packs each of this year's Historic Collection set "Back To The 70's" and the Rookie Edition set. The Furuta set and the "Back To The 70's" set have been out for a few months, but the Rookie Edition packs have just hit the stores in the past few weeks. First the Furuta set. This is a box set of 27 cards commemorating the career of Swallows catcher Atsuya Furuta. BBM has produced a couple of sets like this in the last few years and I normally don't get them, but I've always been a fan of Furuta's so I decided to pick this one up. The folks at YakyuShop tracked one down for me. It was a bit steeper than I'd have liked at $45, but the price was driven up by the possibility of memorabilia cards in the set. (This is NOT a complaint about YakyuShop's price - their price is pretty much in line with BBM's recommended price for the set.) So naturally, I didn't get any of the memorabilia cards in the set, but it's still a nice little set. There's a card showing what I think is a picture from when he was drafted in the 1990 (well, November 1989) draft, cards commemorating his All Star Game MVPs in 1991 and 1992 and the championship teams he played on in 1993, 1995, 1997 and 2001 and a reprint of his 1991 BBM card. 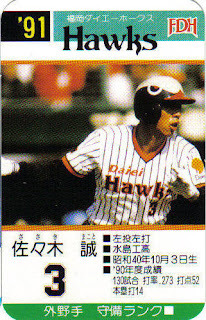 There are also cards celebrating the times he appeared on the cover of "Weekly Baseball", reaching 2000 hits, and his final game. There's one card showing him playing positions other than catcher - he's playing first on the front of the card and outfield on the back. The "Back To The 70's" set showcases retired (OB) players who starred in the 1970's or active players who were born in the 70's. There are 72 cards from each group. I did pretty well with the six packs I got - I got 11 OB players, 12 active players and 4 insert cards to go with only 3 doubles (there were 5 cards in a pack). 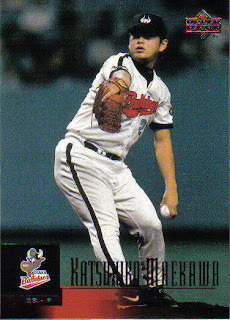 Of the four insert cards, two were actually serially numbered ones - a "Legend Star" Mitsuru Fujiwara (#88 of 200) and really cool "Photographic Card" of Makoto Matsubara (#55 of 100). The Matsubara card has something like a raised frame around the picture. So basically, the "Back To The 70's" set is a typical Historic Collection set. I'd like them better if they only had OB players, but they're usually pretty cool. The Rookie Edition set is basically a draft pick set. I'm not really up on how the draft is done in Japan, but it looks like from Deanna Rubin's posts that there's a draft of high school players in October, then college, industrial league and whereever else players in November. (I say "whereever else" because Kazuhito Tadano, one time Cleveland Indian prospect, was drafted by the Fighters this past November. I remember Makoto Suzuki being in the draft a few years back as well. Perhaps it's for previously undrafted Japanese citizens returning from abroad?). Anyway, typically the Rookie Edition set contains cards for the players drafted, cards of somewhat random active players that show pictures of them from their rookie year and cards of the new managers. This year's set appears to be no different. 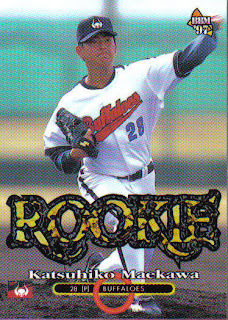 Of the six packs (six cards to a pack) that I got, I got 21 draftee cards, 8 active player cards, 1 new manager card and 1 insert card (an "07 Rookie" card of Takuya Asao) along with 5 doubles (this is BBM, of course). I didn't get a Sho Nakata card, but I did get cards of the other three guys on the card wrapper - Yuki Karakawa, Kohei Hasebe and Yoshinori Satoh. The Rookie Edition set kind of "is-what-it-is". I always like to get a few packs from it, but usually a couple of cards of guys holding holding up a baseball or making a "guts" pose is enough. 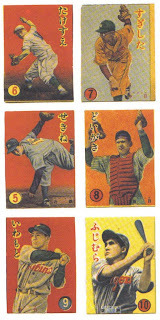 Takara produced team sets of playable baseball cards from 1978 until 1998. Each team set would come in a box containing the 30 player cards (and one team logo card), a pair of dice and a paper playing field to be used as a game board. The fronts of the player cards featured a picture of the player along with biographical information. The backs of the cards had the information for the player for playing the game - basically the outcomes of rolling the dice. Great to know there are other fans out there that have that game!! First, preparation. Each team prepares 9 players each, making a side. Place the pitcher on the mound of the field and the batter in the batters box, runners on the bases. Fielders - place them to the side. Make sure they are organised so you have a set batting order. I like to place them alongside the field like a bench. Ok, the basics are, you should have a paper field. and there should be a grid on that field of the dice (you are supposed to have two dice). Each person rolls the dice (defending team and the offensive team) and you determine the result by the combination. For example 6 and 4 may be a 'ball'. If from the combination you get 'H', it means it's a hit. If you get this you flip over the card of the batter in the box and then determine the result of the 'hit'. For example 5 and 2 may be a Homerun for Tomonori Maeda, 4 and 1 may be a ground out for Ichiro. So when you get a single or a double you put that batter to that base. Bunt: when you get 'H' claim a bunt and roll the dice, if you get the numbers (sum of the dice) listed for succesful bunt you are successful, but otherwise fail. if the sum of the dice matches the numbers listed to suceed a steal you're in. Long running: This is for example a runner on first scoring home from a double, for this after the player hits a double and you have a runner on first instead of just hitting third claim a run to home and roll the dice, same procedure. They are the basics, if you need to know anymore or if my explanation was a bit cheap, don't hesitate to let me know and I will be more than happy to talk to you more about it. 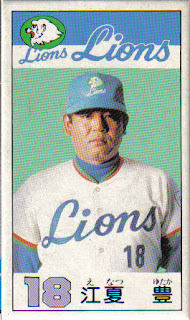 The first few years (78-80) Takara only produced cards for the Central League teams. From 1981 until their final year in 1998, they produced cards for all 12 teams. 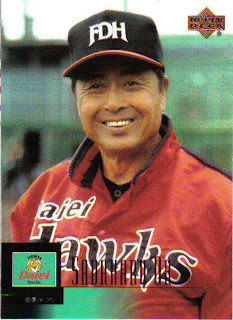 Prior to 1991, the pictures on the cards were simple head shots of the players. Most of the pictures were very similar from year to year. Starting in 1991, however, most of the pictures were action shots. I suspect this had something to do with BBM starting up in 1991, but I don't know that for sure. (I call the pre-1991 years the "mug shot era".) 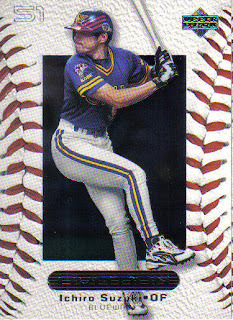 The basic design of the cards stayed pretty similar from year to year, especially from 1989 to 1995 where it really looks like the only thing that changed was the year. Takara produced a set of 20 card team sets in 1984 that are referred to as the "Takara Kids" sets. The intent was to have a simpler dice game aimed at children. The cards were a bit smaller and were thick card board, like the old menko cards. Takara stopped producing the sets after 1998. I don't know why they stopped or even if the company is still in business. 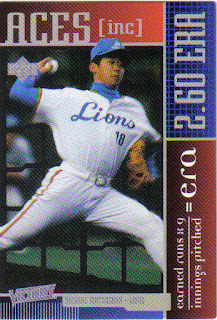 The Takara cards I'm showing in this post are (from top to bottom): Yukio Tanaka's 1988 card, the back of Koji Akiyama's 1994 card, Motonobu Tanishige's 1994 card, Kazuhiro Kiyohara's 1996 card, Ben Oglivie's 1987 card, Hideo Nomo's 1990 card, Makoto Sasaki's 1991 card, Yutaka Enatsu's 1984 Takara Kids card, and the oddball 1997 card of Shigeo Nagashima. 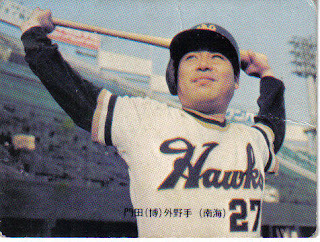 This is Oh's 1975/76 Calbee card #326, which is from the subset I mentioned here that kinda, sorta looks like the 1975 Topps set. Topps has an insert set of cards called "Trading Card History" included with the new 2008 Topps Series 1 cards. 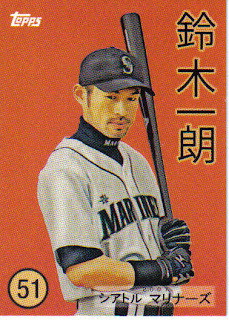 While I normally don't pay a whole lot of attention to the US cards, the Ichiro card from this set caught my eye. 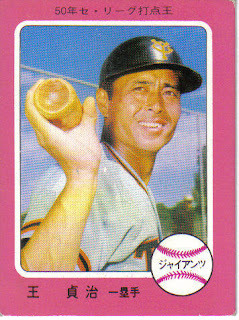 While most of the cards in the set are in the style of a set from Topps' history (Hideki Okajima has a card in the style of 1965 Topps, for example), the Ichiro card is listed as simply "Japanese Baseball Card". So naturally, I had to try to figure out what (if any) particular set's design they had used. It looked like something from the 1940's or 50's, but none of the menko cards I'd seen really fit. 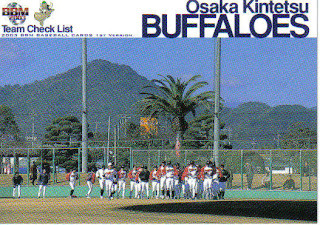 The circle with the uniform number reminded me of some of the Karuta cards I'd seen in Gary Engel's "Japanese Baseball Card Checklist And Price Guide" and Engel's and John Gall's "Sayonara Home Run!" books. (Karuta is a type of card game.) 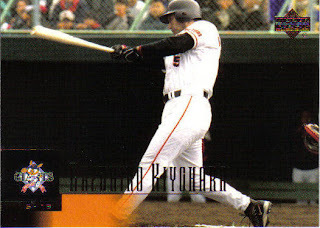 And sure enough, the Ichiro card looks very similar to what the Price Guide refers to as the "1950 New Year Magazine Furoku Insert" set. Page 128 of "Sayonara Home Run!" shows several of the cards from this set (at least I think they're from this set - they're only identified in the book as 1950 Karuta cards). I've scanned part of that page in and included it below. Just a reminder that traning camps have been open for a week and a half in Japan and pitchers and catchers report this week in the US. 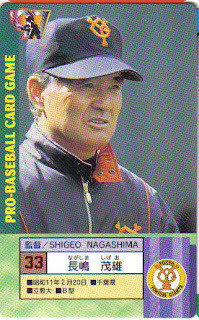 In 2000 and 2001, the American card company Upper Deck released four sets of Japanese baseball cards, two each year. 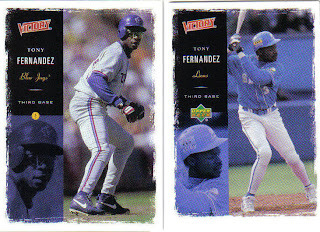 Each set (Victory & Ovation in 2000, Victory and Upper Deck in 2001) used the same design as the equivalent State-side set (as the two Tony Fernandez cards below show). Sometimes you'll see items on Ebay that advertise a card from one of these sets as being the player's "first US card". That's not really true, as these cards were only for the Japanese market. The first set released in 2000 was the Victory set. This set featured 60 "regular" cards of players and managers (five per team), a six card "Stat Leaders" subset, a 12 card Aces Inc subset (featuring pitchers) and a 12 card Hardball Heroes subset (featuring batters). There was also a nine card Superstar Showcase insert set. 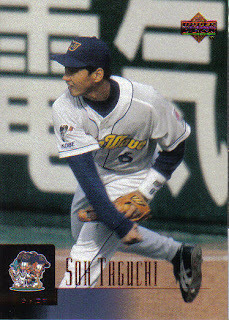 Players from the set who went on to play in the US include Ichiro, Kosuke Fukudome, Tsuyoshi Shinjyo, Keiichi Yabu, So Taguchi, Norihiro Nakamura, Kazuo Matsui, Daisuke Matsuzaka, Kazuhisa Ishii, Shingo Takatsu, Kenji Johjima and Hideki Matsui. Upper Deck followed this with a higher end set called Ovation. This set featured embossed card fronts meant to look and feel like a baseball. 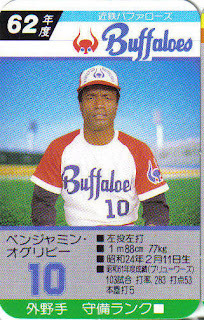 The set featured 60 "regular" player cards (five per team, no managers). There were several insert sets (a 24 card Oendan Favorites set, an 18 card 40 Home Run club set, a six card Ken Griffey Jr set, a 30 card Rising Stars set and a 12 card Standing Ovation set) as well as several Game Used bat and shoe sets. The cards in the Rising Stars and Standing Ovation insert sets were individually numbered to 2000 and 2500 respectively. 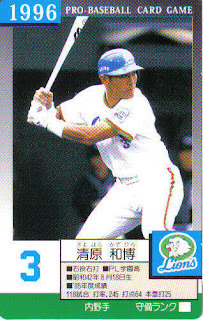 Players in the regular set who went on to play in the US include Kosuke Fukudome, Kenji Johjima, Tsuyoshi Shinjyo, Keiichi Yabu, Ichiro, So Taguchi, Norihiro Nakamura, Akinori Ohsuka, Kazuo Matsui, Daisuke Matsuzaka, Kazuhisa Ishii, Shingo Takatsu, and Hideki Matsui. 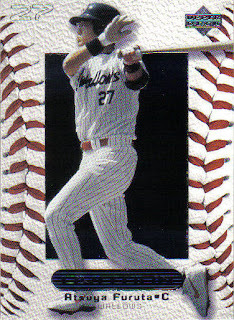 In 2001, Upper Deck returned with another version of the Victory set. 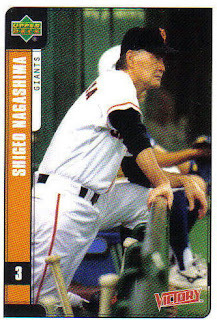 The set expanded to 72 "regular" player and manager cards (six per team), a six card "Stat Leaders" subset (oddly not having a card for batting leaders as that would have required them to show the now departed Ichiro), and a 12 card Strike King subset (featuring pitchers). There was also a 12 card Victory's Sluggers insert set. 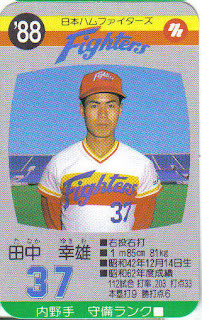 Players in the regular set who went on to play in the US include Kosuke Fukudome, Kenji Johjima, Keiichi Yabu, So Taguchi, Akinori Ohtsuka, Kazuo Matsui, Shingo Takatsu, Satoru Komiyama, Kazuhisa Ishii, Hiroki Kuroda and Daisuke Matsuzaka. 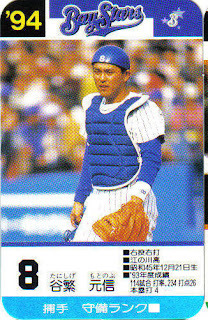 Hideki Matsui, Kazuo Matsui and Norihiro Nakamura were only available in the Victory's Sluggers insert set. 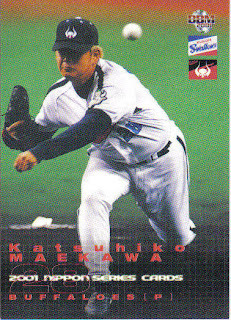 The final Japanese Upper Deck issue was the beautiful 180 card set known simply as the 2001 Upper Deck set. Following the States-side design again, this set featured gorgeous full bleed photos on the front of each card. 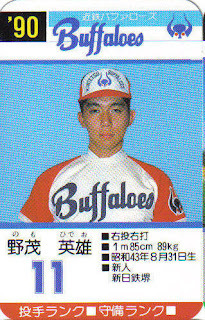 There were 15 cards per team, including the managers and two "Star Rookies". 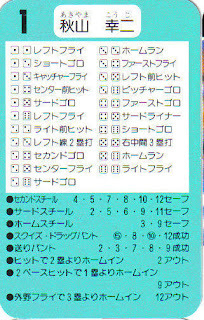 There were a number of insert sets (a 12 card Rookie Roundup set, an 18 card Best 9 set, an 18 card Home Run Explosion set and a 9 card Stars Of Japan set that featured Japanese players currently playing in the US) as well as several Game Used bat and shoe sets. 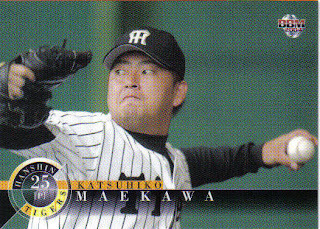 Players in the regular set who went on to play in the US include Masahide Kobayashi, Kosuke Fukudome, Tadahito Iguchi, Kenji Johjima, Keiichi Yabu, Hiroki Kuroda, Koo Dae Sung, So Taguchi, Katsuhiko Maekawa, Norihiro Nakamura, Akinori Ohtsuka, Kazuo Matsui, Daisuke Matsuzaka, Shinji Mori, Kazuhisa Ishii, Akinori Iwamura, Shingo Takatsu, Satoru Komiyama, Takashi Saitoh, Hideki Matsui and Hideki Okajima. This set is easily one of my top 10 favorite Japanese sets of all time. 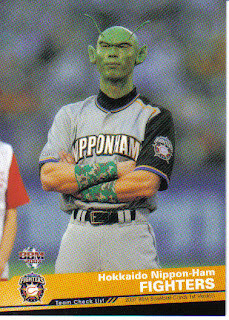 I'm sure there's a fascinating story in here somewhere on why Upper Deck decided to enter the Japanese baseball card market, the obstacles they encountered in doing so and why they didn't produce any more cards after 2001. Unfortunately, I don't know what that story is. 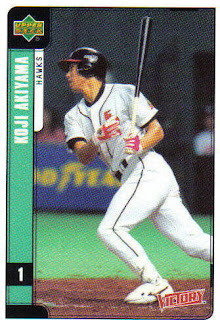 This was probably the most serious competition that BBM has ever had for it's perch on top of the Japanese basball card market. From top to bottom, that's his 1997 BBM card (#463), his 2001 Upper Deck card (#119), his 2001 BBM Nippon Series set card (#S35) and his 2004 BBM Tigers card (#T20). This is the Fighters team checklist card from the 2007 BBM 1st Version set (#491). Training camps opened Friday in Japan. Spring can't be far away.